B Corporations (known as B Corps, for short) are “a new type of company that uses the power of business to solve social and environmental problems.” As of May 2014, there are now more than 1,000 certified B Corporations, in 33 countries and 60 industries. Among the most well-known companies that are certified B Corporations are: Patagonia, Ben and Jerry’s, Method, and Seventh Generation. There is also an Environment sub-group of Best for the World honorees, for the companies that scored in the top 10% of all B Corps within the environmental impact category. And there are sub-groups for the top 10% companies for worker impact, as well as community impact. Click here to find other B Corps (you can search by location, name, industry, keyword). Several certification programs have emerged to rate the sustainability of mixed-use, neighborhood and community-scale developments—addressing a wider range of issues than previous rating systems for individual buildings have addressed. These broader-scale certification programs include: LEED for Neighborhood Development, and the Living Building Challenge (Update: There is now also a Living Community Challenge program). The programs’ requirements can be used as planning and design guidelines for any project, even if official third-party certification is not the goal. There is also a non-certification framework called One Planet Communities. 1. LEED for Neighborhood Development (LEED ND): LEED ND was developed as a collaboration between the U.S. Green Building Council, the Congress for the New Urbanism, and the Natural Resources Defense Council. 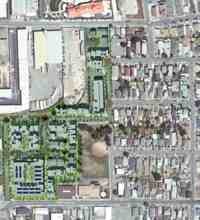 LEED ND integrates the principles of smart growth, urbanism, and green building into neighborhood design. It aims to promote walkable, livable communities that reduce urban sprawl, decrease automobile dependence, provide housing close to jobs and services, and benefit environmental and public health. LEED ND credits are organized into the following categories: Smart Location and Linkage; Neighborhood Pattern and Design; Green Infrastructure and Buildings; Innovation and Design Process; and Regional issues. Stage 3: Certification of a project once construction has been completed. LEED ND pilot developments that have been constructed include: Solea Condominiums in Washington DC (Stage 3 Gold certified); Eliot Tower in Portland, OR (Stage 3 Silver certified); Excelsior and Grand in St. Louis Park, MN (Stage 3 Certified); Whistler Crossing in Riverdale (Chicago area), IL (Stage 3 Certified); and Celadon in Charlotte, NC (Stage 3 Certified). 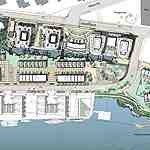 And a couple of notable LEED ND pilot projects that are well underway are: Dockside Green in Victoria, British Columbia (Stage 2 Platinum certified plan), and Tassafaronga Village in Oakland, CA (Stage 2 Gold certified plan). In addition to these programs, many organizations are working to advance the sustainability of neighborhoods and communities in a variety of ways. Two active organizations that are focused primarily on planning, design, and development include: Partnership for Sustainable Communities (for whom I recently did some research and writing) and Urban Re:Vision. A number of local, grassroots initiatives for community sustainability, resiliency, and energy independence—such as Transition initiatives—are also gaining steam around the country and the world. Update (added 4/21/10): For a searchable database of “ecovillages” around the U.S. and the world, see the Global Ecovillage Network website. Click here to download a more comprehensive listing of organizations and websites focused on sustainable communities (4-page, 80 KB PDF file – updated June 2010). 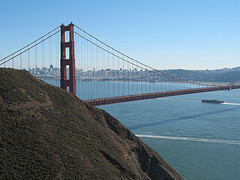 The listing includes national, California-based, and San Francisco Bay Area resources. For other good info on sustainable communities, smart growth, and green neighborhood design and development, check out Kaid Benfield’s NRDC blog. In a later post, I’ll be covering larger-scale, municipal-level sustainable planning initiatives for entire cities and regions. Stay tuned. Here is my listing of all North Bay building projects that have achieved LEED certification to date. 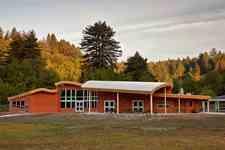 And here’s a longer listing of green building projects (of all sorts, not only LEED projects) that I’m aware of in the North Bay. And a quick update on the stats for LEED Platinum projects worldwide: According to my latest calculations (as of December 2009), 46 states and 12 countries (including the U.S.) now have at least one LEED Platinum certified building. China and Great Britain are the latest countries to join the ranks of those with a LEED Platinum rated project. Within the United States, California—with more than 50 Platinum certified projects so far—is home to more Platinum projects than any other state. If you’d like to recommend other green events that will be happening in the Bay Area this fall, feel free to mention them in the Comments section. This is an addendum to the previous post for those of you who live in (or near) Marin or Sonoma County, California. We are fortunate to have a plethora of amazing farms and sustainable agriculture resources in this area. 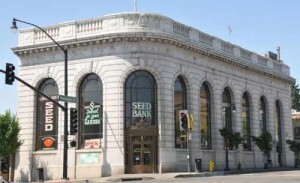 One very cool new addition to our local scene is the “Seed Bank” store, located in a historic bank building at a major intersection in downtown Petaluma (Washington and Petaluma Blvd.). The store sells more than 1,200 varieties of non-GMO Baker Creek Heirloom Seeds. You might also want to check out the Hidden Bounty of Marin, a recently produced 1/2-hour film about the farms and farmers of beautiful West Marin; it shows the rich variety of agricultural enterprises in this region—from dairy, produce, and oyster farming to cattle, hog, and sheep ranching. There are many great family farms in this area. Wild Blue Farm, Toluma Farms (goat dairy), and Straus Family Creamery are some of my favorites, as they’re the farms that I’m most familiar with. And lastly, here’s my list of links to other sustainability-related resources in the North Bay region of the San Francisco Bay Area. If you have other favorite local organizations or resources to recommend, please share them in the Comments section below. Thanks! The new California Academy of Sciences museum in San Francisco’s Golden Gate Park recently opened its doors to the public. The building achieved the Platinum (top-tier) rating in the LEED (Leadership in Energy and Environmental Design) green building rating system. Designed by Renzo Piano, Stantec Architecture, and Arup, the 410,000-square-foot building is the largest public Platinum-rated project in the world (to date). Featuring a four-story rainforest exhibit, an aquarium, a planetarium, and an enormous (and hilly) “living roof” (AKA a vegetated or green roof) that visitors can access, the museum is proving to be wildly popular. If you go there soon, be prepared for crowds. If you’d like to know where other LEED Platinum buildings are throughout the country or the world, click here: LEED Platinum Certified Buildings Worldwide. I also developed an interactive Google map of green buildings in San Francisco, and I keep updated lists of green building projects in the San Francisco Bay Area and all LEED certified projects in Northern California.